So last night we got to add another one to the list, the 2016 Mt. Boucherie Merlot. The wine is 100% Merlot grapes and as expected was a dark burgundy in colour. 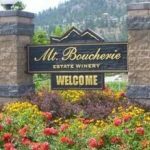 The grapes are a mix from the family vineyards in the Similkameen Valley, Okanagan Falls and the Golden Mile. The wine had flavours of dark fruits, notably blackberries and plums. The finish was smooth with a hint of dark chocolate. Overall a very solid Merlot in our opinion. At $24.99 a bottle this is a nice dinner wine that would pair with any red meat dinner. Or of course anything else you want to pair it with too! We, Jeff and Tara Ciecko of CK Golf write two blogs, one is our 19th Hole Blog where we share personal experiences and the other an Industry Blog where we comment on general business and internet marketing best practices, sales strategies and give golf industry related opinions. We have owned CK Golf for 9 years and provide marketing, social media and business services to the golf and other industries. As of August 2016 our life and our business will be ‘location independent’. Our 19th Hole Blog is about the places we visit and the things we do. If you have any questions or comments, or happen to be in the same location as us please reach out and contact us anytime.